Don’t our logos look great together? 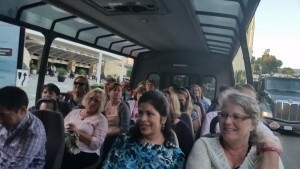 While in Hollywood, “the Indigo Girls” of Indigo Trade Solutions kidnapped a small, but very fun, group of friends and took them on a little adventure. If you haven’t heard of TMZ TV, take a moment to look them up at http://www.tmz.com. It’s a celebrity gossip magazine in video form. 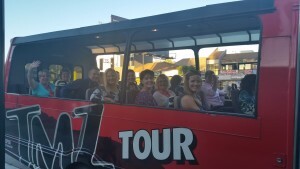 And what fun the tour was! Friends of Indigo from across the country joined Lesley and Stephanie and hopped aboard an open air bus to tour some Hollywood hot spots in search of stars. Sadly, there were no celeb sightings, but our guide Neisha supplied plenty of fun celebrity stories and videos. The Roxy, The Laugh Factory, Rodeo Drive and Beverly Hills were just a few of the hot spots that we cruised past. A great time was had by all and we capped the night off with a fantastic dinner at Laurel Hardware, where we treated like celebrities. It was a refreshing break to spend time with this fantastic group. Aren’t they a great looking bunch? Thank you Indigo Girls for a great time! It was fun to be with old friends and meet new ones. Great pics! Awesome time! I will wear my t-shirt with pride. Thank you Indigo Trade Solutions. You Indigo Girls sure know how to throw a party! Thank you Lesley and Stephanie for an awesome evening! Such a fun night and the restaurant was AMAZING! Thank you so very much.